A D.C. man has been charged with arson and murder after police say he started a fire in an abandoned house in Seat Pleasant, Maryland, earlier this month, killing two men. Thomas Gerald Deal, 53, of Northeast D.C., told Prince George's County police he was smoking crack cocaine minutes before the fire was reported early the morning of Nov. 2, charging documents say. Flames overtook the house and killed Derrick McDowell, 51, of Upper Marlboro, and Alphonso Driver, 56, of Oxon Hill, police said Thursday. They died of burns and smoke inhalation, according to the charging documents. Their bodies were so badly burned, they needed to be identified by their fingerprints. 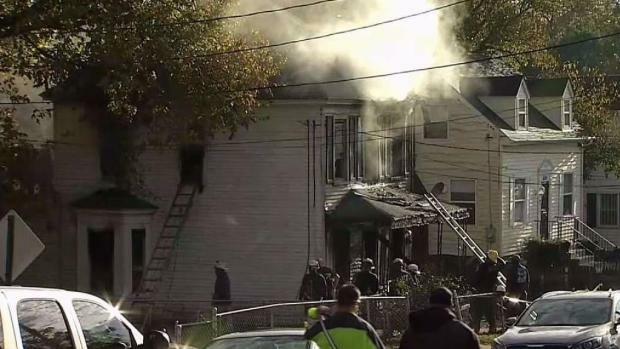 Two people were found dead inside a vacant home after a massive fire early Wednesday morning. Prince George's County Bureau Chief Tracee Wilkins reports. Firefighters responded to the blaze on the 6200 block of Foote Street, a block from the D.C. border, at 5:30 a.m. Nov. 2. When they arrived, heavy flames had overtaken the first and second floors. Photos show the house completely engulfed in flames. "It was getting hotter by the second," said next-door neighbor Demarco Boone, who woke up to find the house burning from top to bottom. The siding on his house was damaged by the fire. After the fire was extinguished, two bodes were found in separate bedrooms on the second floor. Police said surveillance footage shows a man enter the house minutes before the fire. Several "flickering flashes of light" could be seen through a rear window of the house, which was abandoned after a foreclosure. Detectives showed the video to two witnesses of the fire. Both people said the man shown in the footage was "Gerald," the charging documents say. Police said Deal told them he is the man shown in the video and that he had been flicking a lighter. Police did not release any information on a possible motive. Deal faces two counts of first-degree murder and arson. He is in the custody of the Department of Corrections. City officials said police had been called to the vacant home several times. The house was one of almost 150 foreclosed and abandoned homes in Seat Pleasant. According to tax records, Bank of America owns the house, which was supposed to be empty. Michael Nesbitt-Gaines, who lives across the street, says he called 911 to report suspicious activity just one day before the deadly fire. "There were some guys and they had a car and they were moving a refrigerator out of the home. So I knew that was a little suspect," Nesbitt-Gaines said. "They've boarded this house up several times trying to keep them out," neighbor Mozella Simpkins said. The city of Seat Pleasant has started buying foreclosed homes and rehabbing them. Anyone with additional information on the crime is asked to call 301-772-4295. Anonymous information can be submitted by calling 1-866-411-TIPS.